Okay I did not hear about this, may be you have and apparently Razer fans know of this already. The new Razer Tiamat 7.1 headset is a 7.1 headset and will be here in January 2012, delayed from its earlier date of December. The Razer Tiamat 7.1 headset is a unique piece of gaming kit and is equipped with 10 discrete drivers, 5 in each circumaural ear cup to give you true pinpoint positional surround sound. The 10 drivers represent the 7 surround sound channels plus subwoofer; 2 for center, 1 each for the left and right, surround sound left and right, surround back left and right, and 2 for the subwoofer. All drivers work in unison to produce a true surround sound experience. Razer in a statement said, “We announced the Razer Tiamat back in August and promised that it would be ready to ship in Q4 this year. Plenty of customers emailed and wrote in through our community channels inquiring if it would be ready by Christmas. The bad news is – it won’t be ready by Christmas. 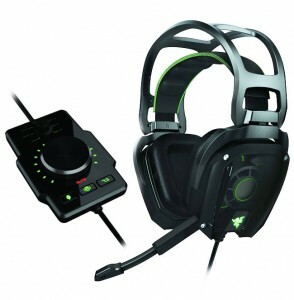 We estimate that the Razer Tiamat will only be available around the end of January 2012. Next Nice – Angry Birds Lights Up Holiday! !